Fall River, MA – Saint Anne’s Hospital Regional Cancer Center has been awarded a three-year term of accreditation in radiation oncology as the result of a recent review by the American College of Radiology. Radiation oncology is the planned application of high-energy radiation to treat cancer. A radiation oncologist may use radiation to cure cancer or to relieve a cancer patient’s pain. Since 1992, Saint Anne’s Hospital Regional Cancer Center’s radiation therapy services have been provided by radiation physician specialists from Brigham and Women’s Physician Organization who also hold appointments at the Dana-Farber Cancer Institute and Harvard Medical School. “Accreditation by the American College of Radiology in Radiation Oncology is the gold standard. It underscores Saint Anne’s commitment to providing safe, progressively sophisticated radiation therapy for since it was introduced in 1979,” said Raymond Dugal, MD, Saint Anne’s chief of radiation oncology. Dr. Dugal expressed gratitude to the program’s team for working together to continually enhance the program’s radiation therapy program at its locations in Fall River and North Dartmouth. The team includes board-certified radiation oncology physicians, radiation oncology board-certified medical physicists, dosimetrists, therapists, and oncology-certified registered nurses, as well as registered dietitians, social workers, chaplains, outreach workers, and other support staff who specialize in cancer care. “Through our team’s expertise and adherence to the industry’s rigorous standards of quality care, Saint Anne’s Hospital has led the way in the Greater Fall River-New Bedford area in providing advanced cancer care,” Dr. Dugal said. “We are proud of our state-of-the-art technology, but even more important is having a well developed, mature program, staffed by highly trained and experienced staff. We are pleased and gratified to be recognized for providing safe, effective and expert care to our patients,” he said. Multidimensional CT technology for state-of-the-art treatment planning. Four linear accelerators that provide state-of-the art external beam therapy, stereotactic radiosurgery (SRS), stereotactic body radiation therapy (SBRT), intensity-modulated radiation therapy (IMRT), high-dose rate (HDR) radiation therapy, and image-guided radiation therapy (IGRT). SRS, SBRT, IMRT, HDR, and IGRT have specific, high-level applications for treatment of brain and other neurological tumors; gynecologic, breast and skin cancers; tumors in the chest and abdomen that may move with normal breathing; and cancers of the head and neck, lung, pelvic region, and other sites. Radioactive prostate seed implant therapy for the treatment of prostate cancer. Fiducial markers (also known as “gold seeds”) that are used for image guidance in the treatment of prostate cancer. 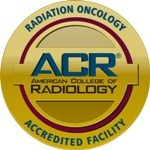 The ACR is the nation’s oldest and most widely accepted radiation oncology accrediting body, with more than 600 accredited sites and 27 years of accreditation experience. The ACR seal of accreditation represents the highest level of quality and patient safety. It is awarded only to facilities meeting specific Practice Guidelines and Technical Standards developed by ACR after a peer-review evaluation by board-certified radiation oncologists and medical physicists who are experts in the field. Patient care and treatment, patient safety, personnel qualifications, adequacy of facility equipment, quality control procedures, and quality assurance programs are assessed. The findings are reported to the ACR Committee on Radiation Oncology Accreditation, which subsequently provides the practice with a comprehensive report they can use for continuous practice improvement. More information is available at www.acr.org. Saint Anne’s Hospital is a community hospital with comprehensive inpatient, outpatient, and emergency care services, serving adults and children from southeastern Massachusetts and nearby Rhode Island at its main campus in Fall River and its community satellites. Founded in 1906 by the Dominican Sisters of the Presentation, Saint Anne's Hospital is a member of Steward Health Care System, the largest community-based accountable care organization in New England. Saint Anne’s has been recognized time and again for quality, safety and service by such organizations as The Joint Commission, Healthgrades, The Leapfrog Group, and Blue Cross Blue Shield. Additional information is available at www.steward.org and www.saintanneshospital.org. Steward Health Care System LLC is the largest community-based accountable care organization in New England, comprising more than 3,000 physicians, 11 acute care hospitals, managed care, insurance programs, home care, an imaging operation, and a number of other post-acute services, to provide the most cost-effective and highest quality of integrated patient care. For more information, visit www.steward.org.